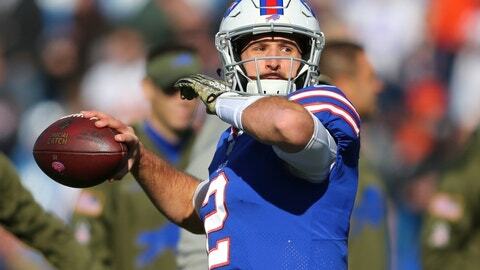 ORCHARD PARK, N.Y. (AP) — Nathan Peterman’s turnover-over prone days with the Buffalo Bills are over after the second-year player was cut by the team on Monday. The move was announced as the Bills (3-7) enter their bye week, and not long after coach Sean McDermott backed Peterman earlier in the day. “I’m still confident in Nate,” he said. McDermott’s recent decisions, however, did not appear to match his belief in a player who threw seven interceptions in four appearances this season, and 13 overall in nine career games, including a brief playoff stint last season. Peterman became the odd man out on a team carrying four quarterbacks, and with rookie Josh Allen set to reclaim his starting job after missing four games with a sprained right throwing elbow. The Bills are off until they host Jacksonville on Nov. 25. Peterman was passed on the depth chart by Matt Barkley, who took over the starting job in a 41-10 win over the New York Jets on Sunday. McDermott opted to start Barkley, despite having just signed with Buffalo on Oct. 30, and a week after Peterman — starting in place of injured veteran backup Derek Anderson (concussion) — threw three interceptions in a 41-9 loss to Chicago. Buffalo considered Peterman to be a project in selecting him with a fifth-round pick in the 2017 draft out of Pittsburgh. He spent his final two seasons at Pitt after transferring from Tennessee. This year, the 24-year-old went from winning a three-way offseason quarterback competition, which also included AJ McCarron, to being off the team entirely. His starting tenure lasted two series into the third quarter, after which he was pulled in favor of Allen in a season-opening 47-3 loss at Baltimore. Things unraveled further when Peterman took over after Allen was hurt in the third quarter of a 20-13 loss at Houston on Oct. 14. After hitting Zay Jones for a go-ahead touchdown, Peterman closed the game by throwing two interceptions, including one returned for the decisive score in the final two minutes. He’s best remembered for throwing five interceptions in the first half of his first career start in a 54-24 loss at the Los Angeles Chargers a little under a year ago. Following the loss, McDermott acknowledged to his players he erred in electing to start Peterman ahead of Tyrod Taylor in a bid to spark an underperforming offense in the midst of a two-game skid. Taylor reclaimed the starting duties the following week, and closed the season 4-2 in helping Buffalo end a 17-season playoff drought, which had been the longest active streak in North America’s four major professional sports. Overall, including playoffs, Peterman went 69 of 133 for 563 yards and three touchdowns. Peterman maintained an upbeat approach despite his struggles. He also didn’t shy away from acknowledging his miscues.